This project was a continuation of a job completed the previous year. The objective was to transform a relatively unusable piece of the homeowner’s property into something that is functional, as well as connect it aesthetically to the already completed pool area. First, the height of their existing brick retaining wall was increased and faced with cultured stone. This created continuity between the two projects and support for the upper patio. 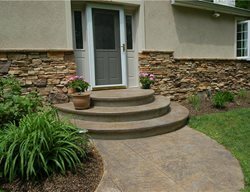 This patio would function as an entertainment area along with a space for a large grill. Also, by overlooking the pool, it works as a comfortable vantage point for the homeowners to watch their children and guests as they use the pool. 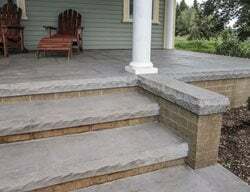 Since this raised patio serves as the main access to the pool, the steps exiting the house needed to be rebuilt. 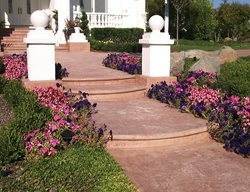 They were designed to direct the flow of traffic towards the center of the patio, as well as create a point of visual interest. Next, the upper patio level was connected to the lower pool level. 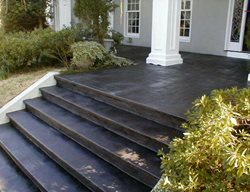 This was accomplished with a combination of steps and platforms constructed between two large curbs. This transition between the two levels worked well with the existing grade. 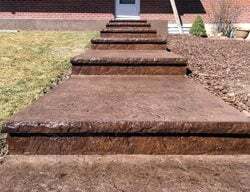 The addition of the curbs made landscaping easier by helping to retain soil and planting areas. 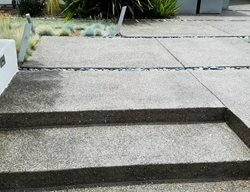 The curbs also defined the walkway in a more dramatic fashion. 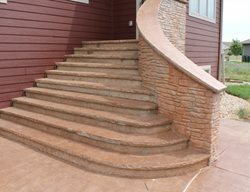 The foundation of the house and all the step risers were finished with cultured stone to provide continuity on all vertical surfaces. 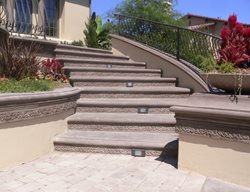 The homeowners took the project one step further by placing low voltage lighting underneath the bullnose of each step. 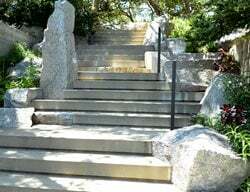 This not only helped to demonstrate the aesthetics of the stonework at night, but also illuminated the steps and made them safer for use. 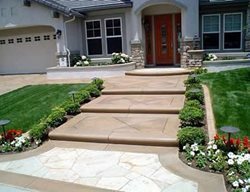 All of the steps and the patio area were poured using a unique two step process. First, a structural slab is poured that consists of 2 ¼” structural synthetic fibers and ½” rebar. These horizontal surfaces are then scarified in preparation to receive cast-in-place concrete tiles. 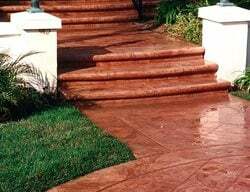 The CIP concrete tile is mixed onsite with pva fibers, integral color, and an internal water repellent. The pattern is applied using “cookie cutter” style stamps that stamp through to the structural slab. 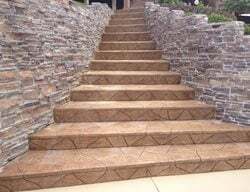 Everything is then textured using a textured roller to create the look of stone, as well as a slip resistant surface. The curbs were poured all at once with an integral color and 2 ¼” structural synthetic fibers with no construction joints. Everything is then grouted, here the customer chose a darker brown. All horizontal areas were then sealed with an acyclic cure and seal. 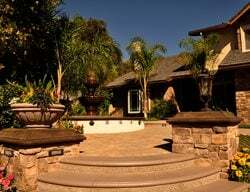 By creating a usable patio area where there was once just a steep grassy slope and connecting this area to the pool with a sidewalk and steps, this backyard became more dramatic, functional, and safer to use. 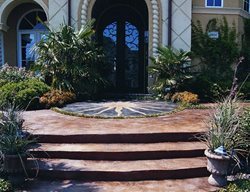 This residential walkway has integrally colored concrete in a Roman slate stamp pattern with saw cuts.